Looking for that perfect kid-sized cup? 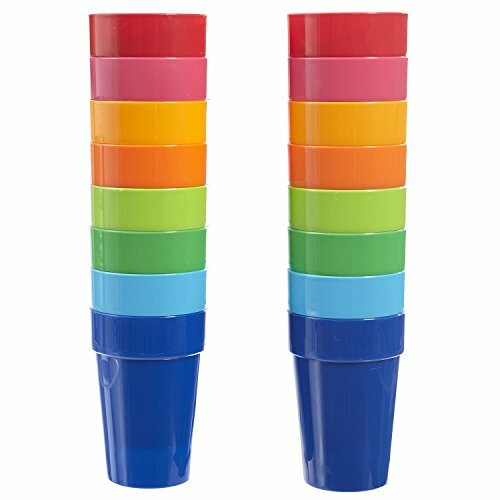 With 16 pieces, the spectrum of 8 colors (2 of each color) are great for differentiating one kid's cup from another. These vibrant colors add whimsy and fun to any kids table. Great for everyday and outdoor use! Stackable for maximizing storage and shelf space. Made of break-resistant BPA-free restaurant quality material, these tumblers are top rack dishwasher safe, BPA-free, and made in USA by US Acrylic - a leading manufacturer of the finest quality products since 1978. Also available from US Acrylic for individual purchase from the Spectrum Collection are the Set of 12 | Spectrum 20-ounce Water Tumblers in 6 Assorted Colors. GREAT VALUE! A value-packed set that is a step up from disposable drinkware. Versatile enough for everyday use. TAKE IT OUTSIDE! Great for patio, poolside, picnic, and other outdoor use. Stackable for maximizing storage and shelf space. MADE IN USA! Made of restaurant quality BPA-free material. Top rack dishwasher safe. Volume capacity: 10oz. Height: 4-1/4" Mouth diameter: 2-7/8"